As I am a ‘Mom’ I feel like I can now legitimately wear mom jeans. (Ok, so that’s a lie I owned a pair pre pregnancy!) But still, SOME things have changed. Since becoming a mother, I have sensibly, sized up. These jeans are a tad loose around the waist but they are COMFY! And that my friends is what I am all about these days, comfort and ease. 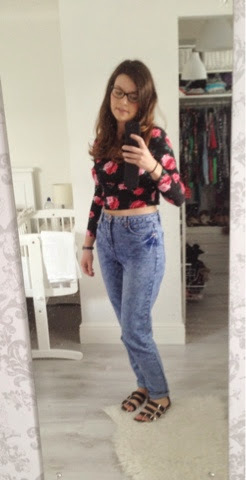 These Mom jeans are from Newlook and I purchased them recently. They were £24.99. Mine are a size 12. The floral crop is another fairly recent purchase. I bought it on a birthday shopping trip whilst I was still pregnant but this is the first time my size has allowed me to wear it. No one wants to see a pregnant belly! I find long-ish cropped tops/tees and high waisted bottoms the easiest things the wear when breast feeding. The crop means there isn’t as much fabric to get in the way when you are trying to latch on but there is still enough fabric for you to cover your modesty when baby is feeding. The high waisted bottoms mean your not flashing your belly to the world either. The top is from h and m. This is a size M and was £7.99. My sandals were from primark last summer and I love them dearly hence why you have seen rather a lot of them lately. I think I have worn them every day this week. They are just so easy to throw on. Like I said comfort and eeease.